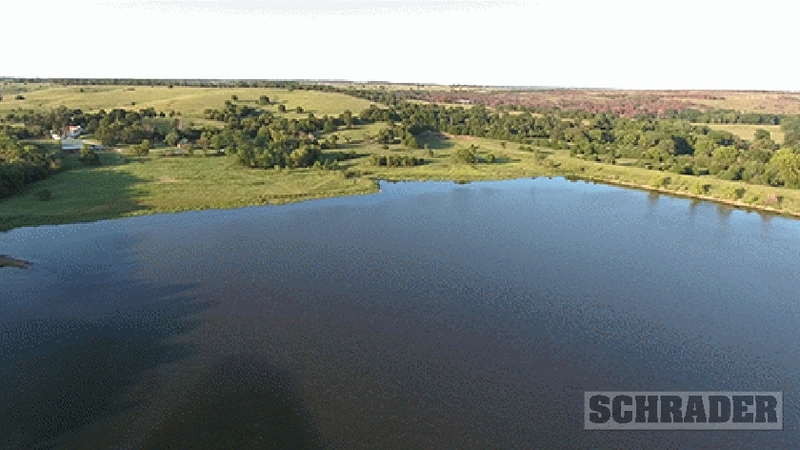 INDEPENDENCE, Kansas (Oct. 4, 2016) — Brougham Ranch, a 7,672-acre cattle and recreational ranch in the Chautauqua Hills of Southeast Kansas, will be offered at auction Thursday, Nov. 17, with Schrader Real Estate and Auction Company conducting the event. Located between Independence and Sedan, the ranch will be offered in 12 tracts, including fenced, native grassland and recreational tracts with woods, a large watershed lake, ponds and creeks. “This is a big, beautiful ranch with a lot of variation among the tracts and some gorgeous topography. We have grassland with great exterior fencing, ponds, pipe working pens, cross fenced pastures, and other facilities, such as a home and a hunting lodge. The land has been well managed for both grazing and for wildlife habitat, and it has excellent interior roads and trails,” said Brent Wellings, who is managing the auction for Schrader. The ranch is located on both sides of Independence Road in Chautauqua County. Schrader personnel will be at the property October 13, November 3, and November 16 to accommodate inspections and provide detailed information. Individuals interested in additional information on that event may visit www.schraderauction.com or call 800-451-2709. The auction will begin at 2 p.m. Thursday, November 17, at the West Campus of Independence Community College, 2615 West Main, Independence, Kansas.